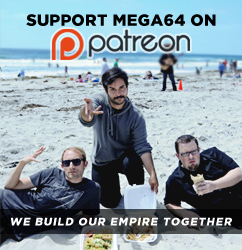 MEGA64 DOES KICKSTARTER? AND A NEW PODCAST TOO? WHAT IS THIS? Please consider donating to our friends at SARNOTECH for their amazing RPG, "SAKRED DIAMONDZ." The crew looks talented and the game looks amazing for sure! Please spread this wherever you can! We also wanted to let you know that our previously out of print "Campfire" shirt, and the always-out-of-sizes "Brain Fog" shirt are both back in FULL STOCK in our Mega64 online store! However, our new hoodie and Neon shirt have both sold out... as well as our Colossus shirt. We'll try to get that stuff back in stock ASAP. It always pays off to order our junk as soon as possible! And last but not least- We have a new podcast too! Mega64 Podcast Episode 254! In this episode: We've traveled all over the county since last we spoke. We talk about PAX East and the things we saw in Boston. Then we flew straight to San Francisco for GDC! We try to cover all of that, plus cover the new games we've been playing. This podcast runs a little long... By that, I mean it's a podcast and a half. Literally. Enjoy. Listen to the audio version here!